Finally, after long pause, I did some mosaic. It's Dione (and rings) from images which Cassini took on 12.12.2011. Mosaic contains high resolution data from 14 images and color from another 42 (filters UV3, GRN, and IR1). Colors are set to approximately natural look. Original high resolution images had resolution 349 - 476 m/pix and final mosaic has 300 m/pix resolution. Great mosaic and one of the best ones of Dione I have seen. The Cassini ISS data set contains a huge amount of interesting stuff - it should be easy to find source data to make thousands of spectacular mosaics if time permitted. Thanks! BTW, such mosaics are relatively easy to assemble thanks to your IMG2PNG calibration routine. So I thank you! I looked at Cassini's data and for moons we can assemble a few dozens of larger mosaics (3×3 individual frames or more). Little problem is, that several image processors are doing such mosaics and it's probably good idea not to duplicate works of others. So every time before assembly of mosaic I'm doing little research who did what. If you find nice large mosaics that are not in my image library already, please tell me (or just post links here)!  I will include them and hopefully that will help you not duplicate others' work. 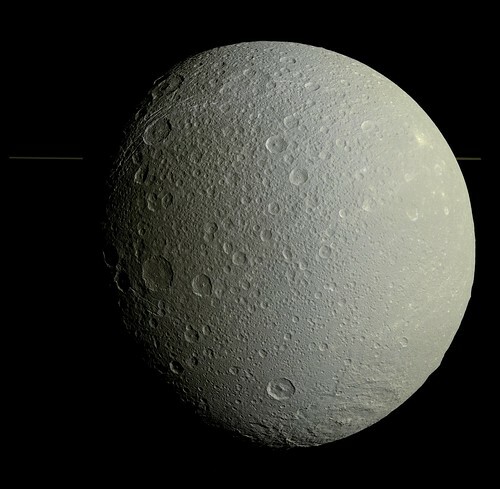 I have your lovely Dione mosaic queued for posting but there has been so much good stuff to post lately that it's still in reserve. I used the same data for a greyscale montage a while back here. Your processing is much better though and you've taken the time to add the colour as well which I just ran out of patience with. I'm interested to know why you didn't add in the other moons which were part of the data. I'll try to do some list. I've used data from the same flyby but they are not the same data as yours. Three reasons. 1. Data with moons have lower resolution. 2. Data with moons are BW only. 3. I saw BW Emily's mosaic with moons on the Planetary Society blog. I agree with both kyokugaisha and machi on this discussion. As a curator, I like seeing multiple (good) versions of image products, because it helps me to demonstrate how subjective choices are made during processing, and those choices differ from person to person. Of course, I also like seeing unique, new products, because there is so much underappreciated data in the archives. Both are valued! Here is my take on a crescent Dione taken on approach to the Rev 16 flyby (October 11, 2005). 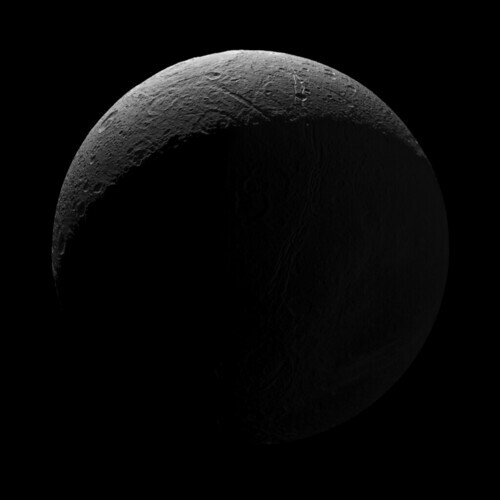 It uses a high-resolution NAC mosaic along the daylit limb of Dione, and then fills the remainder with a WAC image where Dione's night side is backlit by Saturnshine. I also found a nice three-frame black and white mosaic from Rev 27 (August 18, 2006) looking over Dione's south pole. The Saturn-facing side of the trailing hemisphere is nicely backlit here as well.